Home | Amphibians | Salamanders | I Found an Orange Salamander: Is it a Red Eft and Does it Make a Good Pet? As the summer weather cools and kids return home from camp, questions concerning Red Eft care are among the most frequent I receive. Bold, brightly-colored, and often out by day, Red Efts are more commonly-collected by children than any other amphibian. And, being attractive and seemingly-benign, they are also less likely to be rejected outright by parents. However, efts are temperature sensitive and require a specialized diet. Unfortunately, they are poorly-suited to captivity, especially when inexperienced owners are involved. In the following article I’ll explain why, and will offer some alternative species and care tips to folks intent on trying to keep these beautiful salamanders. Natural History: What is an Eft? The term “Eft” refers to a temporary land stage in the life cycle of the Eastern Newt (Notophthalmus viridescens). This species’ huge range extends from southern Canada through most of the central and eastern USA to Texas and Florida; in North America, only the Tiger Salamander has a wider distribution. Four subspecies have been described. 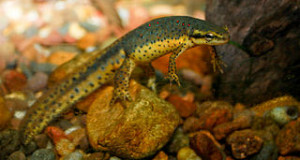 The olive-green, red-spotted adult newts are aquatic, and at one time were a pet trade mainstay. Many states now prohibit collection, but where ownership is legal they make wonderful introductions to amphibian care (please see the article below). In most populations, Eastern Newt larvae transform into orange to red-colored efts. The efts leave the natal pond and take-up residence in forested areas. The eft stage generally lasts from 2-3 years, but may extend to 7 years in the northern part of the range and in mountainous habitats. The eft stage is skipped in certain populations, with the larvae developing directly into aquatic adults. “Eft-skipping” was first documented on Long Island, NY, but has since been found among all subspecies, and across the range. It most often occurs where the land surrounding breeding ponds is sandy or otherwise inhospitable to moisture-loving amphibians. Efts are well-protected by powerful skin toxins. This seems to account for their tendency to wander about on damp days, seemingly oblivious to the attentions of curious children (always wash after handling one, as their skin secretions can irritate mucus membranes, eyes and wounds). Several other species, including the Mud Salamander (Pseudotriton montanus) and the Red Salamander (P. ruber), are believed to mimic the Red Eft in order to discourage predators. Wild-caught efts are not at all shy, and willingly forge by day. Judging by the questions I receive, however, it seems that many Red Eft owners are first-time salamander keepers, and are not prepared for the work involved in keeping these gaudy little gems. By the time most folks write in, their once-perky little pets are lethargic and emaciated. Red Efts require a highly-varied diet comprised of tiny invertebrates, and will not accept the dry foods and pellets favored by adult newts. Those experienced in keeping Dart Poison Frogs and other small amphibians usually have no trouble with efts, as a number of frog foods suit them well. Flightless fruit flies, 10-day old crickets, springtails, bean beetle larvae and sow bugs can be purchased from online dealers, and are readily accepted. In order to add variety to the diet, termites, millipedes, tiny earthworms, beetles and other small leaf-litter invertebrates should also be collected when possible (please see the article linked below). While different eft population vary in regard to temperature requirements, most fare poorly when kept at 72 F or warmer for any length of time. A cool basement or similar location is essential to their survival. Children are drawn to efts because they accept handling without protest. However, it’s important to realize that handling damages the skin’s protective mucus covering, leaving the animal exposed to attack by bacteria and other pathogens. As mentioned above, skin secretions can also irritate people. Furthermore, all amphibians can be assumed to harbor Salmonella bacteria. While infections are easily preventable if proper hygiene is maintained, children must be supervised carefully. Those seeking a land-dweller cannot do better than the Fire Salamander. These gorgeous creatures, captive bred in large numbers, are among the most responsive of all amphibians…and, with proper care, they may live to age 30, 40, or beyond! Please see the article linked below. 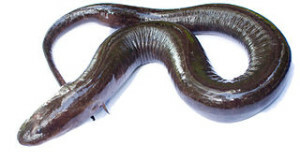 A wide array of semi-aquatic species, including Fire-Bellied, Paddle-Tailed and Ribbed Newts, are being bred in captivity and make hardy, long-lived pets. As mentioned earlier, the Red Eft’s adult phase is also a good choice, but captive-bred specimens are scarce. Please see the linked articles and post your comments below if you’d like more details on newt and salamander care. Thought I’d give an update after my aquarium labors. Your advice on the previous salamander/newt owning page has been a newt life saver I think. I completely redid my 55 gallon tank to be aquatic with a floating ‘dock’ (from amazon) that I hope to get moss to grow on or something green and have already started the water cycling with help of an already established betta fish tank (and the fish!). He loves it in the new tank, will be relocated before the newts arrive no worries. Anyways, again NJ has all these rules so I’ve settled on two adult red spotted newts. I thought four might be a bit crowded. My anole is also happy since the ripped out land section of the 55 gallon went into his cage, adding more plants to his already luxurious set up. Waiting for the water chemical levels to stabilize but so far so good with “0” everything across the board for the last week. So my question is how should I introduce the adult newts to the tank when I purchase them? How long should I wait for the tank to be established? Should I wait until after winter at this point? They’d have to be shipped and I worry about their health during the trip. Thanks for the update…your fish experience should be a big help in keeping newts…most aquarists make great amphib keepers. Java moss will grow on wet surfaces; pothos can work as well. You can introduce by adding an equal volume of your water to that in which they came; they may be shipped in moist moss…putting them directly in the tank, after allowing them to adjust to the temp. , will be fine if water quality is good. Shipment can be hard on them…high temps and abrasions during shipment are the main concerns.